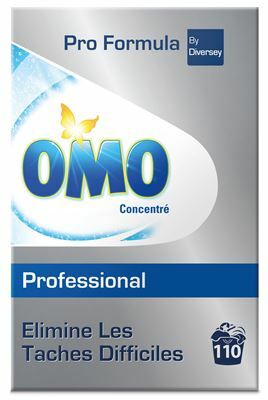 OMO Professional Concentrate is a concentrated powder specially formulated for washing laundry in communities. Effective in both hard and soft water, suitable for all professional machines and all types of laundry. A perfectly clean environment is the indispensable element for a successful customer experience. Pro Formula by Diversey offers you a complete line of cleaning products specifically formulated for professionals and trusted brands to bring you the best results from the first use. With peace of mind, you just have to focus on your core business. • Concentrated powder, 1 barrel of 7.7 kg = 110 washes. • A formula adapted to the needs of professionals, particularly effective on the dirt encountered in the community. • A reinforced soap and surfactant blend provides OMO Concentrate with very good detergent properties. • The combination of bleaching agents and the chemical compound TAED makes it possible to act from 30 ° C.